The day we took leave of Kasol, and the Himalayas, and begin our journey to our boring, monotonous, daily life was today for some of us. We woke up that day quite late and went to have breakfast in the hotel where we were joined by all.Remember Nikhi and I wanted to go to river rafting earlier, but didn’t, we had decided to go on day 11 and by now everyone wanted to do it too. So in a way it was good we didn’t go then ‘coz now we went with the whole gang :D. The para-gliding got left out though 🙁 Boohoo :’(.So morning we discussed our plans and I wanted to buy something from Kasol as a souvenir. Problem was we were all lacking money, we had brought some cash and got ATM cards but but but there are no ATMs in Kasol!!! You have to go upto Jari for that. So with what money we had, Keerthi and I went to the Kasol market to buy some stuff. I got a nice cosy shawl 🙂 and I don’t remember what he got 😛 and after that he went in search of Ashwyn for some photos and he didn’t join us in the rafting. Nor did Pranav and Kalpit. By the time I left Kasol, I had fallen in love with it, it s so beautiful and so nice after all. It was a place I could now reckon with. Sometimes, when I look back, other than the obvious feelings I get of returning there, and the Himalayas, I sometimes feel like I should settle down there or in Grahan eventually :). When I told this to Keerthi later, he was kind enough to suggest an alternative profession for me :P. Kasol has the 2nd best hashish in the world and there are a lot of people selling this illegally (maybe) over there. So he suggested that I settle in Kasol and sell hashish for a living :O :O :O. And when I told Shyam about my ideas, he said that he would need a free supply of hashish when he comes next for trekking :P. So if you ever find me in Kasol, I would definitely not be selling anything :P. I think I should probably settle in Grahan and teach at the school there (Like Amir Khan in 3 idiots opening a school in Ladakh :P). Anyways that’s for future to decide 🙂 🙂 :). Back to where we were. We had missed the bus and we booked a vehicle to go to a rafting location in Bhunter (There are several). Since Jai and Rajni uncle didn’t want to do rafting and as the vehicle only accommodated 9 people, Nikhi, Naveen, Shyam, Nirav, Sandeep, Chatur, Yugi, Vikas and me set off. I slept through most of the journey and we withdrew money at Jari and finally reached the rafting location. We kept our luggage including the cameras and mobiles and took only Sandeep’s camera along so we hardly have any pics of the rafting. 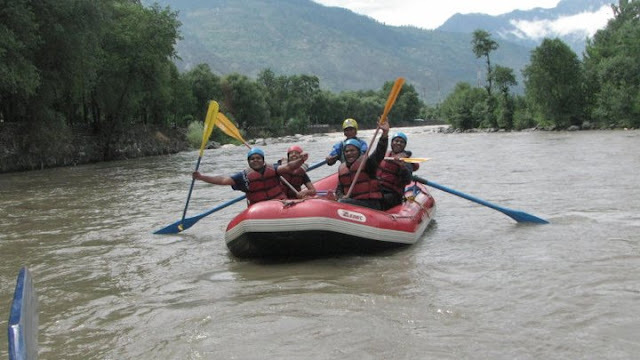 We had 2 rafts – Nikhi, Sandeep, Yugi, Naveen and Vikas got into one and Me, Shyam, Chatur and Nirav got into another. I don’t remember the level of rafting but it was not a difficult one. We went and the chilled water splashing on you rapidly is an awesome experience. I guess this was the Baes river. Rivers Parvati and Beas combine and then the water flows as Beas river. I can’t describe the rafting experience, you have to experience it yourself to know it :). As we rafted, we chatted with our guide or boatman or however you describe him. He is the strong guy who does the actual oaring and has full control. We just do it in some parts as per his directions. He was a nice guy and he told he takes part in rafting competitions :). He said he was from Nepal and he asked us where we were from. For this Chatur gave such a fundoo reply that I still laugh when I think about it 😀 😀 :D. Chatur replied “Bhaiya hum upar se hai, Sar Pass se”. Hahahahahhahahahahhahahaha Chatur had made us natives of Sar Pass just like that 😀 😀 :D. At one point we could get into the water. I don’t know to swim but wanted to get in the water too. So, trusting my life jacket, and the guide I got in holding the rope. If I had found the water chilling before, it appeared warm compared to what I felt now *Burrrhhhhhh*. I came back in the raft along with the others and now no more felt a chill when water splashed :D. We soon reached the end point which is a distance away from the starting point. After having delicious pakodas here, we set off again but not in a raft this time but in the back side of a transportation tempo :O. It was a extremely bumpy and Shyam the Sherpa hung out of the van for most part of the journey 😀 and here too, they drive like crazy on the narrow roads 😀 😀 :D. Awesome :D. We reached the starting point, where we met some of our fellow SP22 mates who had come for rafting too. We bid adieu to them, changed (you have to get dry :P) and set off to find our boarding point for bus. We got into a local bus(but missed out sitting on the roof top because there was place inside to stand 🙁 🙁 🙁 ). The one thing I remember was the songs being played in the bus were of Hindi movies of the 90s. It reminded us all of the school days since these were the songs we grew up listening to :). We finally reached the boarding place which was some hotel. Keerthi, Sudhakar, Manju, Ashwyn and Neeloy were already here, each with a colourful long beaded string from some part of their hair and Keerthi with a colourful goatee 😀 😀 ). We had dosas there (inspite of my protests ) and soon the buses arrived. Sandeep, Nirav, Shyam had decided to go to Manali. Initially, Nikhi and I had this plan too, but we had to collect her luggage from her friend in Delhi and since I had not seen Delhi before, we decided to spend the next day in Delhi before returning to Bangalore the day after. We later learnt that going to Manali would be a waste because it was spoilt with the tourism and we had seen the upper Himalayas. So they bid farewell to us and Keerthi and Naveen got into their bus for Delhi and Nikhi and I got into ours. As we left, we were not just leaving the Himalayas , but also a bunch of very good friends. We of course stay in touch 😛 thanks to social networking and mobiles etc etc but it still isn’t the same as up there in the mountains :). Thinking of the days spent there, always brings a big smile to my face :). “Arrogant, rude and totally adamant brat; I am not upside down, the world is”, this is how she introduces herself. An avid animator who loves hiking and trekking in the Himalayas.